The classification code for an explosive consists of the Division Number followed by the Compatibility Group Letter. Our Multi-Class Explosives Decals with "cut-away" section enables the carrier to complete the Hazard Class 1 placard with the custom sub-class. 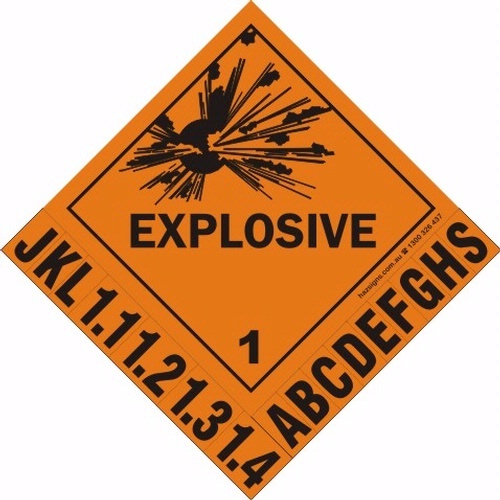 These letters are used to specify controls for the transport and storage of explosives to prevent an increase in risk hazard. Whole decal size is 300 x 300mm - cut down to 250 x 250mm when completed or 150 x 150mm cut down to 125 x 125mm.